A few weekends ago, our refrigerator stopped working. What elevated it from being annoying to obnoxious was the fact that we had bought it brand new less than one year ago. Although the unit was fixed by the end of the day, we still lost everything in our freezer as it stopped working the night before, and most of our refrigerated items became slightly warm and soggy. As I waited for the repairman to show up (they gave us no window of time), I did a quick inventory of what I had in my refrigerator without opening it and knew I had some kale and cauliflower that needed to be salvaged. I quickly opened the refrigerator, snatched up my fresh vegetables along with a bit of leftover broth that needed to also be used up, closed it, then pulled out my dehydrator in the effort to preserve the vegetables without a cool place to store them. 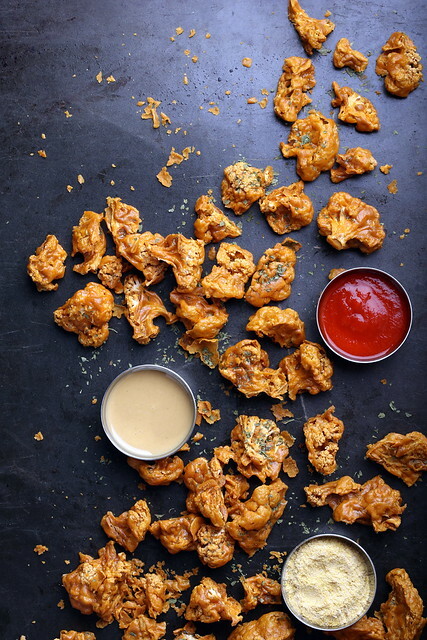 To achieve a jerky-like texture, this cauliflower was drenched in a thick blend of tahini, nutritional yeast, sriracha, apple cider vinegar, liquid smoke and broth, then dried at 130 degrees for 12 hours—and was worth the wait! 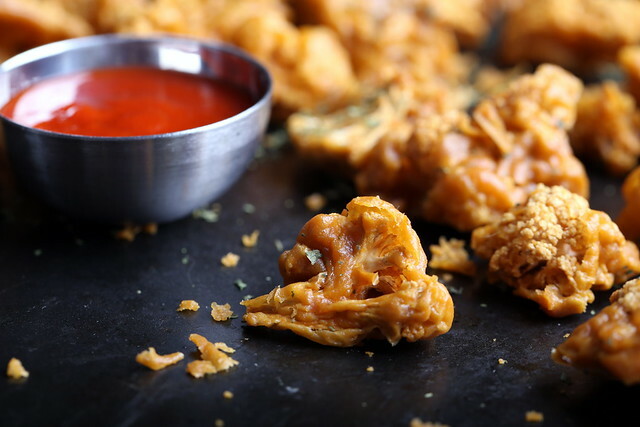 This cauliflower is pleasantly chewy, while the sriracha imparts a nice subtle and even heat throughout. A generous sprinkling of salt before and after dehydration is complete is essential to pull all of the flavors together here while a bit of dried parsley adds a nice pop of color throughout. Combine the tahini, nooch, sriracha, apple cider vinegar, smoke element and salt together. Add in the vegetable broth and gently stir until smooth. 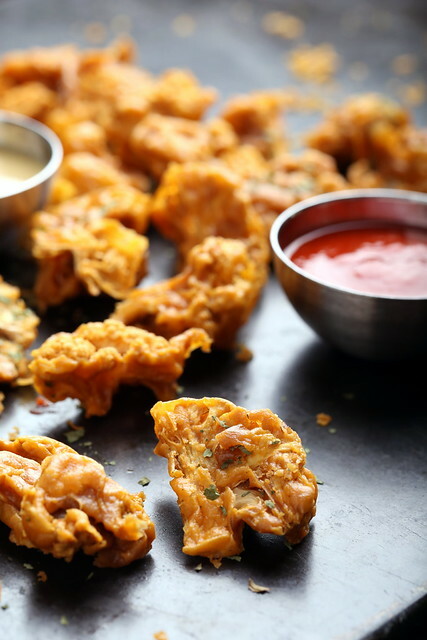 You want it to be the consistency of a beer batter. Add a bit more broth to achieve a thick but smooth texture. Toss the small florets into the mixture. Stir gently until every piece is well covered. Distribute the florets into an ever layer into a dehydrator. Sprinkle the salt evenly over the top. Dehydrate at 130 degrees for 12-14 hours. Sprinkle with a little extra salt and dried parsley to taste once dehydration is complete. *Try to cut the florets as small as possible—the smallest pieces get the chewiest and have the best flavor. You are endlessly creative! This sounds fantastic! Brilliant idea! :O So sorry to hear about the appliance nonsense… at least you know your creativity works well under pressure! Oh to have a dehydrator. Seriously, I just don't have the space (or the money). Some day. What a wonderful idea! I would really like to try this but don't have a dehydrator. Do you think it would still work in an oven set at a really low temperature? Most ovens only go down to 170, so you may not get as a good as a result as drying at 130. These get chewy due to being dried out "low and slow" — but perhaps the oven may give a similar result, good luck! Wow! Always looking for creative ways to use the dehydrator, thank you. Can't wait to make a batch of my own. Ok, just made these…what sauce do you have pictured to serve with them?? Hi Esmae, so happy you made them. : ) I only sprinkled them with a little salt to serve. The picture just shows some of the ingredients that went into the coating: sriracha, nutritional yeast and tahini. I hope you enjoy! yummers.. this is awesome Erin! Wow, this is so creative! And gorgeous photos. Cauliflower is such an under-rated vegetable. My missus and I like to use it as much as possible. We've been looking around for something different and this sounds like a great way to each such a lovely and versatile vegetable. Can't wait to give it a go. Thanks very much. Thanks Jackie — sriracha fixes everything, doesn't it?! Looks delicious! Liquid smoke and smoked paprika are two of my favorite things. It will be hard to decide which to use. Okay yeah. I just put my dehydrator away.. and now I have to get it back out. Awesome! I don't know why I never even considered the fact that cauliflower could be dehydrated, great idea! made these last night. Amazing. Posted your recipe to my FB page. Needless to say, I have to get more caulifower as we ate them all…reminded me of bacon bits…I think next batch will be used on ceasar salads. I'm so happy you tried these and liked it, Daphne! I've made these 3 seperate times and I eat the entire batch in one sitting. I love how you sliced the cauliflower (checked out on your fb page). Thanks so much for sharing and I'm thrilled that you like the recipes! I made these today. SO GOOD. I'm eating them now and will no doubt finish them in one sitting. Thanks so much for this! Thanks so much for trying it out and your feedback! Yes, they are easy to polish off in one sitting. : ) So happy you liked it! Any idea how long these will keep? I assume they would need to be refrigerated, but would that mess with the texture too much? Can't say for sure, Polly—these are always devoured right away! I think refrigeration would turn them mushy, so I'd recommend keeping them out at room temp and serving within an hour. Good luck! Become a Plant-Based Pro at Rouxbe Cooking School!